We stayed with the colours we had done for her other party. 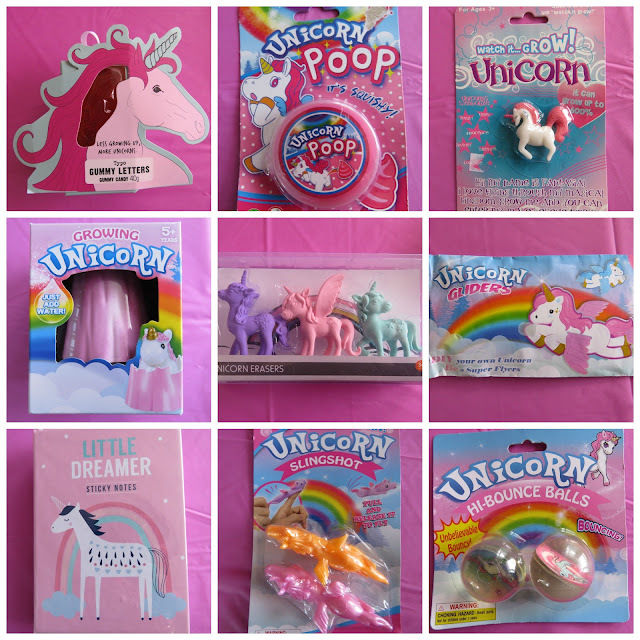 We simply loved the rainbow unicorn and pastel colours. This is the first time we have chosen a theme without trying to get decorations and it made it so much easier. Kmart had a huge selection of large Unicorn Balloons, Unicorn Mirror, Banners, Honeycomb Unicorns, gorgeous Pinata and lots of small Unicorn themed loot treats. We ordered plates and table cloth from Aliexpress and the rest was brought from The Warehouse. It wasn't the best day weather wise, raining so when we saw a break in the weather we made the most of it and went out side to hit the Pinata. All the kids waited patiently for their turns, by the time the second round came up they were cheering each other on. There was no way this Pinata was going to break so I gave it a helping hand and made a small tear. This really got things going and finally it was smashed open. So great seeing all the kids so happy. Pinata Unicorn was bought from Kmart and filled with lollies. Our second game was a Unicorn Relay. We made two groups and one by one they each had a go around the obstacles. 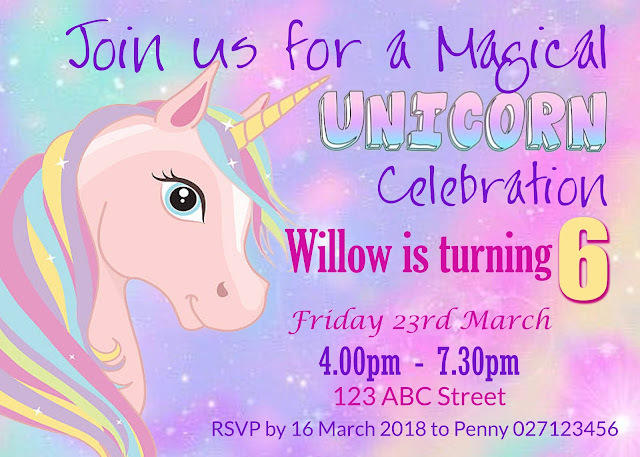 They had to pick up a baby unicorn, ride on a unicorn pole around the cones to the big rainbow where they had to hop into the Hula Hoops and throw a coloured ball into the large inflatable unicorn, then race back and tag the next person in their team. The third game was inside again as the rain was coming down heavy again. Pass the Parcel with a twist. Each layer had something Unicorn related. Here are the questions / Facts / Jokes etc we had on each layer. The final layer was a Unicorn Pencil Holder. 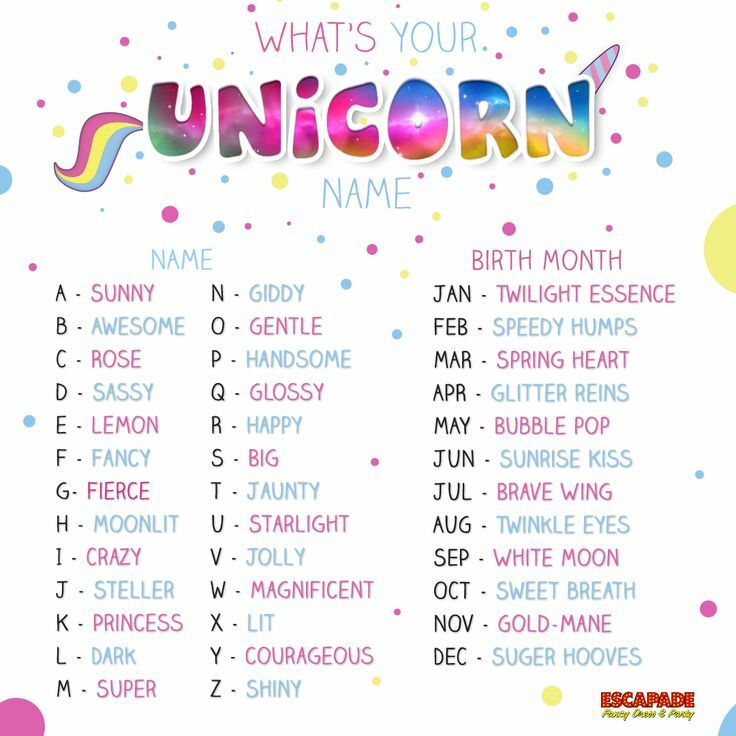 Where would you see a Unicorn? Do Unicorns really exist? Are they Fact or Fiction? What is the National Animal of Scotland? (UNICORN) What is the National Animal of New Zealand? Game Four: Find the Unicorn. using an old game we had made for other parties I painted over the black with pink spray paint. The object of the game is to throw a Unicorn print ball at the cup and try to find the hidden Unicorn. All the cups have mini chocolate bars in them and one has the missing unicorn. We played the game in alphabetical order with every child getting a throw at the board. Well done to George who found the missing unicorn. Game Five was the Chocolate Game. This is Willow's favourite game so had to include this one in her party. For this game you need a large tray, large block of plain chocolate, dice, knife and fork and a prop to put on.I had looked for a unicorn hat but at $20 I decided to save money and go for the funny looking Unicorn Helmet from Kmart for $1.50.All the kids sat in a circle and took turns at rolling the dice trying to get a 6. When someone got a six they had to put on the Unicorn Helmet and cut the chocolate one piece at a time and eat it. When the next person rolls a 6 they take over. It was great seeing everyone cheering each other on. Game Six: Pin the Horn on the Unicorn. I got this game fro Kmart also, and was really surprised to see it had enough stickers for 20 players. Each child took their turn trying to place the horn on the unicorn closest to the mark. The cake! Well this year Willow wanted a rainbow cake. I decided I wouldn't order a cake, how hard could it be and I would be saving money. Well after a day of very stressful moments in the kitchen I will be buying one from now on :) The cake only just standing by the time the party started. Willow cutting her cake open... hoping there will be a rainbow .. Yes Success !!! them an extra few treats s well to take home. 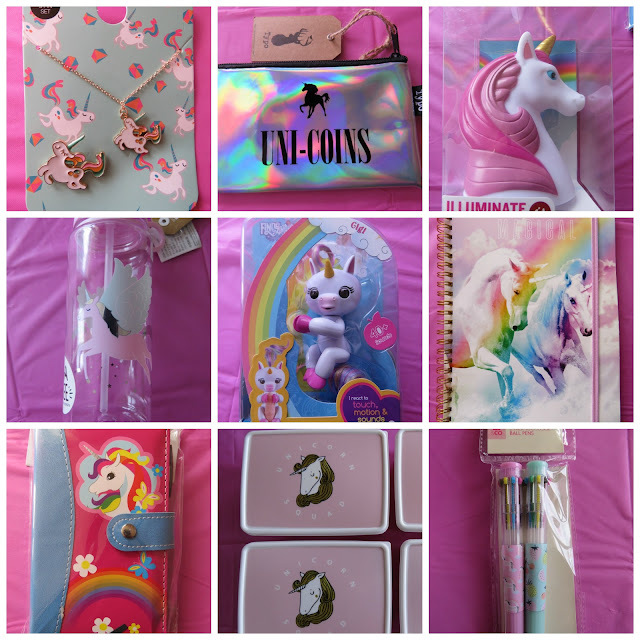 Here are a few ideas of prizes I had for the games and a few presents that were unicorn related. 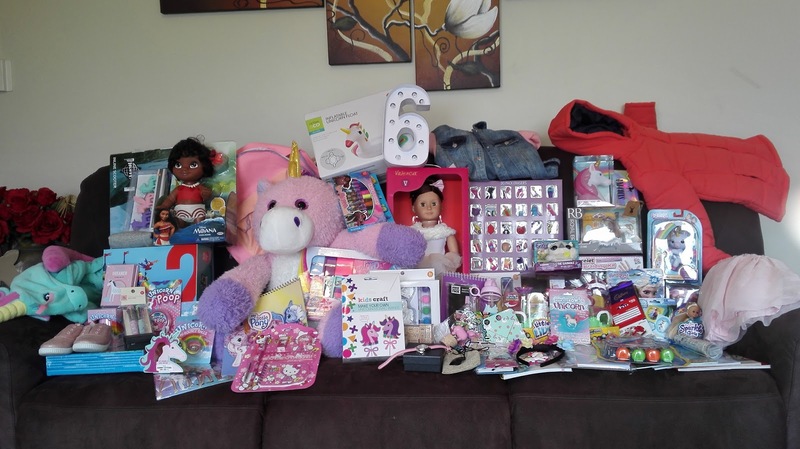 Willow loved having her friends over to help her celebrate her 6th birthday. Thank you so much to everyone for being so well behaved, having amazing manners and being a great friend to Willow. We hope you all had a wonderful time and also a huge thank you for all her amazing presents. We cheerish every moment we have with you. You are a huge ray of sunshine in our lives. Keep being you, enjoy every moment, smile and have fun.